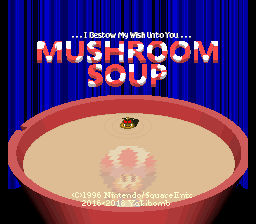 I Bestow My Wish Unto You... Mushroom Soup is a full hack I am developing for Super Mario RPG: Legend of the Seven Stars. I'm trying to roll out eventually. So far, just need to make the battles. So far in the development of the project... I have been working under the hood, changing up the battle system. Please, take a look at this screen shot. This isn't a doctored screen shot. It's from the actual hack--And I'm quite proud of it! There new main additions to the game. They have all been implemented, unless explicitly stated otherwise. The Star Bits System: If you've played any of the Mario RPGs, you know about Flower Points, or FP. In this hack it's replaced with the SB system, or Star Bits. It works like FP in that it's used for Spells, but with a new rule: The player cannot gain any through items, at least it's not planned. To recover SB, the player must have timed an attack with some P-Gauge. What's P-Gauge? The P-Gauge System: In the above screen, you can see the P-Gauge under the character's HP. The purpose of the P-Gauge, or Power Gauge, is to "power up" the character as the battle goes on. The character can gain P-Gauge by 1a) attempting a physical attack on the opponent, 1b) timing the physical attack, 2a) being hit by the opponent, 2b) blocking a hit by the opponent. These work hand-in-hand with eachother, so by the attempt and the timing, you can gain up to +2 P-gauge per event! 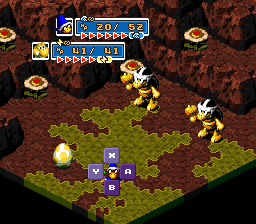 Each character is designated an Elemental Power--For example, the yellow Yoshi's power is Thunder, the blue Magikoopa's power is Ice, and the Toad's power is Heart, only trait left missing in the screen is Fire. The details on what they do are listed below. To lose P-gauge, the character would need to wait two turns without gaining P-Gauge with one of the explained above methods. Some moves allow the player to "spend" the entirety of the P-Gauge for an ultimate move... this feature hasn't been developed yet, but will be in the future. With the Star Bits and P-Gauge combined, the player can recover more Star Bits the more P-Gauge they have. I think that's all I want to show for now... Will keep this post updated! Looking good, didn't know you could do this overhaul in SRPG, looking forward to playing it once its finished. 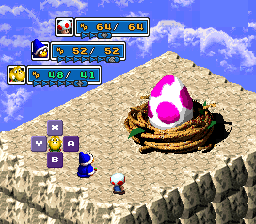 Yoshi rolling up into an egg is a pretty cute defense stance.